Looking for the history of specific Toyota cars or trucks? Check this page! The official Toyota history is, like that of most companies, fairly glossy and bare-bones. An article by Konrad Schreier, in the Complete Book of Toyota (mainly reprints of gushing car reviews) and the Standard Catalog of Imported Cars bring up some of the missing pieces. Why Toyota and not Toyoda? According to a much-quoted article in Wikipedia, the spelling change was made to make it easier to pronounce, symbolize a separation from the founder’s home life, and, possibly most importantly, because Toyota, which takes eight strokes to write in Japanese, is considered to be luckier than Toyoda. Prolific inventor Sakichi Toyoda created the Toyoda Automatic Loom company based on his groundbreaking designs. Licensing one of these inventions to a British company yielded 1 million yen, which he used to help found Toyota Motor Company. The Japanese government also supported the new company, because of the potential military applications of home-built vehicles. The Japanese had relied on foreign trucks in the war in Manchuria, but domestic production would cut costs, provide jobs, and make the country more independent. In 1936 Japan demanded that any automakers selling in the country needed to have a majority of stockholders from their own country, along with all officers, and stopped nearly all imports. Toyoda’s car operations were placed in the hands of Sakichi Toyoda’s son, Kiichiro; they started experimenting with two cylinder engines, then licensed the Chevrolet 65-horsepower “Stovepipe” straight-six, using the same chassis and gearbox, with a body design copied from the Chrysler Airflow. The first engine was produced in 1934 (the Type A), the first car and truck in 1935 (the Model A1 and G1, respectively), and its second car design in 1936 (the model AA). In 1937, Toyota Motor Company was split off from the main business. From 1936 to 1943, only 1,7,57 cars were made – 1,404 sedans and 353 phaetons (model AB), but Toyoda found more success building trucks and busses. The Toyota KB, a 4x4 produced starting in 1941, was a two-ton truck similar to the prewar KC; it had a loading capacity of 1.5 tons and could run up to about 43 mph. The GB was based on the peacetime, 1.5 ton G1 truck, which in turn was based on the Model A1 cars. (From globalspec). The first Toyoda truck was roughly a one-ton to one and a half-ton design, conventional in nature, using (after 1936) an overhead valve six-cylinder engine that appears to have been a clone of the Chevrolet engine of the time: indeed, a large number of parts were interchangeable, and Toyoda trucks captured in the war were serviced by the Allies with Chevrolet components. There was also a forty-horsepower four cylinder model, very similar to the six cylinder in design but rather underpowered for a truck with a full ton of capacity. In December 1945, Toyota was given permission by the United States military to startup up peacetime production. Toyota Motor Corporation had learned from the American War Department’s industrial training program, which worked on process improvement and employee development; the program, abandoned in 1945 by the United States, lived on in Japan as Taiichi Ohno built kaizen and lean manufacturing around it. (From globalspec). After World War II, Toyota was kept busy making trucks, but by 1947 it began making the Model SA, called the Toyopet, a name to stay with Toyota for decades, albeit attached to different cars. The Toyopet was not powerful and had a low top speed – 55 mph from a 27 horsepower engine – but it was designed to be cheap, and to handle the rough roads of postwar Japan. In the five years the SA Toyopet was made, 215 were made. The SD may have been more successful; this taxi version saw 194 copies in just two years. Realizing that production was being held up by the relatively small number of Japanese drivers, the company started a sales division in 1950. The SF Toyopet was the first truly popular Toyota car, with a modified engine (still putting out 27 horsepower) and a taxi version. An RH model with a 48 horsepower engine came out shortly after By 1955, Toyota was making 8,400 cars per year; by 1965, 600,000 cars per year. In addition to all these cars, Toyota started producing a civilian truck named the Land Cruiser. 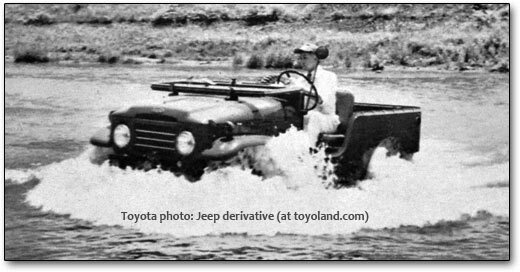 Styled like Jeeps, the original Land Cruisers were, according to Schreier, based heavily on the legendary Dodge half-ton weapons carrier as well as the Bantam (predecessor of the Jeep) They used a bigger engine than the Jeep (their Chevrolet-clone six) and a size and configuration more like the Dodge weapons carrier, whose capacity it shares (one half ton). Starting in 1955, Toyota produced its first luxury car, the Crown, powered by a four cylinder, 1.5-liter engine with a three-speed column shift, followed by the 1-liter Corona; only 700 cars per month were made in 1955, but this rose to 11,750 in 1958, and 50,000 per month in 1964. I am the grandson of the first Toyota dealer in the US. It all started in Larkspur California (San Francisco Bay area). Only two vehicles were available, the Toyopet sedan and the Land Cruiser. San Francisco was where the first distribution center was set up. The highlight of my grandfather’s pioneer Toyota dealership was a personal visit to his home and showroom from Mr Toyoda, the president of the company. His visit was to thank him for his being the first dealer in the US. He presented my grandfather with two Seiko watches which I still possess. The dealership came to a close in 1968 with the passing of my grandfather. In addition to being the first dealer, he also possessed the largest classic car collection west of the Mississippi. He had over 100 classics including Hupmobiles, Packards, Reos, Dodges, Franklins, Marlots, Plymouths, Grahams, etc. In 1959, the company opened its first plant outside Japan - in Brazil. From that point on, Toyota maintained a philosophy of localizing both production and design of its products (that is, adapting vehicles to the places they will be used, as well as building them there). This builds long-term relationships with local suppliers and local labor. Part of this also means that Toyota does not merely build vehicles overseas, but also designs them there, with a network of both design and R&D facilities in North America and Europe. The first Americanized Toyota — the Tiara, otherwise known as the Toyota Corona PT20 — came out in 1964. The six-passenger car had a 90 gross-horsepower engine (probably about 60-70 bhp net); it could reach 90 miles per hour, and was comfortable inside. One year later, the Corona was added at under $2,000; it offered an automatic and factory air as options, very unusual in imported small cars at the time (as was the engine's horsepower rating). Sales hit 6,400 in 1965, and reached 71,000 by 1968, nearly doubling each year until by 1971 Toyota was selling over 300,000 vehicles per year, a far cry from 1964's 2,000. Toyota itself was very small in the late 1950s by world standards, and in 1963 was the 93rd largest non-American corporation in the world — but in 1966 was already 47th (in that time it went from being the 9th largest Japanese corporation to the 6th largest, and for that matter the tenth largest auto manufacturer in the world — it would steadily move up to the #3 position and will soon challenge Ford for #2). Toyota’s first acquisiton, Hino, took place in 1966; the name would be assigned to Toyota trucks into the present day. Toyota bought Daihatsu in in 1967. In 1967, the Corona sold for a reasonable $1,760 - a little below the smallest Big Three sedans — with a good balance of performance, gas mileage, and comfort. By then, Toyota had become well established as a niche player in the United States. The Corona four-door sedan was seen as competing mainly against the Volkswagen Beetle, though this was hardly fair to the modern Corona, with its relatively large interior space and relatively comfortable ride. The Corona was known from its early days for quality as well as a low price, though rust was a serious problem until the late 1970s, causing more than one Corona to simply rust in half before it became old enough to have mechanical problems. 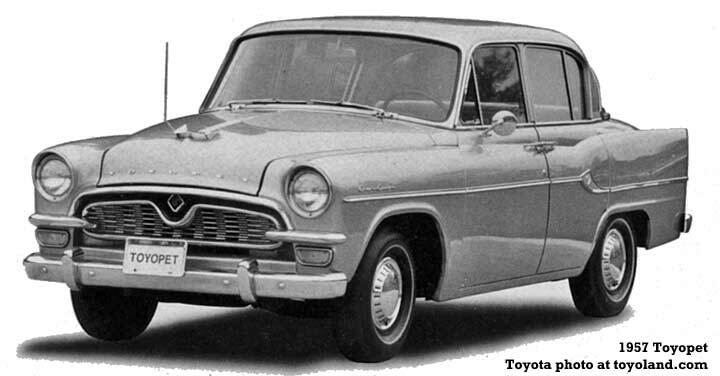 Toyota introduced another new car to the US in 1967: the Crown, available as a wagon or a sedan. The semi-luxury car boasted a brand new 137 cubic inch in-line six-cylinder engine delivering 115 horsepower (gross) at 5,200 rpm; that is a bit more than the biggest Plymouth slant six but less than the smallest American V8. The engine was small but had seven main bearings, tuned induction, semi-hemispherical heads, and was built with lightweight alloys. The Crown came with a four-speed manual (at the time three speeds were normal) or a two-speed automatic (though most Americans were used to three speed automatics). One unusual feature was standard three-point seat belts, not to mention reclining bucket seats. The Crown was never a big seller but it certainly did better than many foreign cars in the segment; the sedan sold for $2,635, the wagon for $2,785. (Torque was 127 lb-ft at 3,600 rpm, bore and stroke 2.95 x 3.35, 8.8:1 compression, single two-barrel carburetor. The Plymouth slant six started at 170 cubic inches by comparison, and delivered 115 hp with 155 lb-ft of torque; the 225 cubic inch slant six put out 145 hp, 215 lb-ft.) The Crown was noted for its road manners, smooth ride, and quiet interior. Soon, Toyota brought to the US the famous but rare 2000GT, which resembled a British sports car with a massive hood and nearly no cabin or trunk. The car had set 16 world speed and endurance records by 1966, with a dual overhead cam six-cylinder engine (150 hp, 121 cid) and five-speed manual transmission. A specially made convertible version was featured in You only live twice. The 2000 GT had surprisingly slow 0-60 times of over 10 seconds, but cornering apparently made up for it, and the quarter-mile went by in a decent enough 15.9 seconds (about the same as a 1995 Neon). Not quite a muscle car, but it probably handled better than the best Detroit had to offer. Toyota also had a variety of trucks for sale in the late 1960s, as detailed in our various truck pages (see the top-of-page menu). The Corolla, to be America’s favorite small car, first arrived in North America in 1969, two years after its first Japanese production, followed by small pickups that earned a strong reputation for reliability and durability. By 1980, Toyota had beaten Chevrolet as the world’s largest single brand — with plants in no less than forty countries. The Corolla was the first Toyota built in the United States, starting in 1985, at the New United Motor Manufacturing (NUMMI) facility in Fremont, California — a joint venture with General Motors; the Chevrolet Nova was essentailly a Corolla with a GM name and stereo. In the early 1980s, the F1 Project and assigned to an engineering team of 1,400 engineers, 2,300 technicians, 60 designers, and 220 support people under the leadership of Shoiji Jimbo and Ichiro Suzuki. Market research for the Lexus name in the United States started in 1985, with Shoiji Jimbo attending focus groups and interviewing dealers. The first running prototype appeared in July 1985, with an astounding 450 running prototypes built as Lexus spared no expense to beat Mercedes and other luxury marques - which it did, decisively. In 1986, tests were conducted on public roads in the US and Germany. Finally, in 1987, the final design was approved after eight presentations to management. The LS400, the first Lexus, finally appeared in 1989. It was an immediate hit thanks to its high levels of luxury and reliability, at a lower cost than Mercedes' far less reliable and luxurious models; the low ebb of the competition also helped Lexus to make a splash. Lexus would remain the leader in passenger car comfort and reliability through to the 21st century, though sales of other models - particularly the IS - lagged. Lexus was finally brought to Japan in 2012. Toyota instituted a three year, 36,000 mile bumper to bumper warranty starting in 1988, the same year the first Toyota-owned American factory started producing Camrys in Kentucky, to join the Corollas built in California. In 1999, Toyota Motor Corporation started listing its shares under the symbol TM on the New York Stock Exchange. Scion was begin in the early 2000s, starting with three cars based off the platform of the old Echo (but brought up to date and refined), with two engines - a small one for the xA and xB, and a 2.4 with an added 50 or so horsepower for the sporty tC. Scion sales were immediately strong in the early-introduction states, leading to a nationwide (United States) launch that, with very little advertising, was still remarkably successful. Like most cars aimed at younger people, the Scions did not attract the younger buyers Toyota was hoping for, at least not in as large numbers as they wanted; but it still brought in a more youthful mix than Toyota or Lexus. Analysts suggested that Scion was brought in mainly because Toyota buyers were growing older, on average, with new Toyotas meant to attract younger audiences (MR2, Celica, Matrix) largely failing to achieve the goal of transforming Toyota's image as a vendor of dull but reliable and comfortable Camrys and Corollas. Today, Toyota is one of the world's largest manufacturers of automobiles in both unit sales and in net sales. In the United States, Toyota has roughly double the sales of Honda and is battling GM and Ford for #1. It produces over 5.5 million vehicles per year, equivalent to one every six seconds. Toyota has tried, partly through sponsorship of numerous events, participation in many racing venues (including NASCAR), public relations around its (largely nonunion and Southern) American assembly plants, and other means, to position itself as just another American company, though no Americans appear to participate in serious decision-making at the Japan headquarters. While German automakers tend to use symbols and numbers, and Americans tend to throw away names frequently, Toyota sticks by a name as long as a car is successful, and doesn't toss names onto cars that don't fit them. The Land Cruiser started in 1950; the Corolla in 1966; the Celica in 1970; the Camry in 1983; the 4Runner in 1984. Notable "dropped" names include the Corona (with its tendency to die from severe rust), Cressida (dropped for the introduction of Lexus in the US), unpopular pickups (T100, HiLux, Compact Pickup), and minivans (Van, Previa). In 1966, Toyota acquired Hino, which built trucks; commercial trucks from Toyota still carry the Hino name. Hino is currently gaining in popularity in Europe, and is the sales leader for medium and heavy-duty diesel trucks in Japan. After building its first truck as far back as 1913 (when it was part of Tokyo Gas), what had been the truck division of Tokyo Gas (and which was now called Diesel Motor Industry Company) split off its commercial truck and diesel engine division into Hino; the remaining part of the company would become Isuzu. Hino did build standard cars for a time, using designs licensed from Renault, but stopped in 1967 to concentrate on heavy trucks (and avoid competing with the rest of Toyota). Hino currently makes a wide variety of heavy trucks and buses, and was involved in designing and/or producing the Tacoma, T100, 4Runner (HiLux Surf), Sequoia, and Tundra. In 1967, Toyota took control of Daihatsu (founded in 1907 as Hatsudoki Seizo Co., Ltd), but Toyota did not actually buy the whole company until 1999. Daihatsu sold cars in the US from 1988 to 1992, with their Charade and Rocky making almost no impact; when Toyota bought into the company, it made a three-wheeled car and military four-wheel-drive vehicles. Daihatsu sold vehicles based on Toyotas, along, possibly, with its own designs; their small cars and four wheel drive vehicles have a following. Daihatsu supplies vehicles and major components to other automakers, and appears to be popular in South America. Denso was not acquired, but was simply spun off of Toyota after World War II; it was once Toyota’s electrical component division. It currently is a roughly $26 billion business with over 100,000 employees and over 170 subsidiaries, selling parts to many major automakers including American companies. These are linked to the pursuit of a new global image for Toyota with four key components: kind to the earth, comfort of life, excitement for the world, and respect for all people. Whether Toyota lives up to that is a matter for debate. In 2009, Akio Toyoda took control of Toyota as President. Son of Shoichiro Toyoda, Akio Toyoda helped to get Toyota out of a Chinese joint venture gone bad and into a deal with China FAW Group; started a Web-based retailing venture in Japan; and is currently executive vice president in charge of purchasing, quality, product management, IT, and transport. Akio, born in 1957, had talked about taking the company beyond its Japanese roots, and emphasized styling and performance in the company’s vehicles, before the 2008-09 downturn. Since then, he has emphasized returning to Toyota’s roots and giving up its drive for market share. Hiroshi Okuda, Chairman. Born in 1933 - about the same time as Toyota itself - Hiroshi Okuda has been a member of the Board of Toyota Motor Corporation since 1982, and has been the Chairman of the Board since 1999. Mr. Okuda was the president of Toyota from 1995 to 1999, and is also a director of KDDI Corporation. Hiroshi Okuda joined Toyota in 1955, at about the time of the company's entrance to the United States market. He mainly worked in Toyota's international operations, and oversaw preparation of manufacturing plants in North America. He graduated from Hitostubashi University with a degree in business, and has a black belt in judo. Fujio Cho, President. Born in 1937 - not long after Toyota itself - Fujio Cho helped to speed Toyota's decision-making but cutting the number of board members in half, appointing three non-Japanese managing officers, and generally streamlining the management structure. He graduated from the University of Tokyo in 1960 and became a production specialist, mentored by none other than Taiichi Ohno. He opened the first Toyota-owned factory in America in 1988. He is a third dan in kendo. It is worth noting the martial arts experience of the two top Toyota leaders. Martial arts require discipline, patience, and study; American leaders tend to be lawyers and accountants with experience in obfuscation and penny-watching. Toyota City sprung from Koromo Town, a thriving silkworm center in the late 1800s and early 1900s. As the demand for raw silk fell, the city declined, until in 1934 it invited the newly-formed Toyota to center there. The name was changed from Koromo to Toyota in 1959. The population is now 25 times its 1930 level, at 350,000. A number of problems with electronic and physical systems combined to cause a hailstorm of recalls and bad publicity in early 2010, as accelerator-sticking and brake-failure problems going back to 2007 were publicized (it turned out that Toyota was almost alone in not having an engine override when the driver had their foot full on the brake). These came on the heels of an “engine sludge” problem affecting one engine used in a large number of Corollas. This prompted Akio Toyoda to take over and change the company’s priority from growth to a return to quality and basic principles.